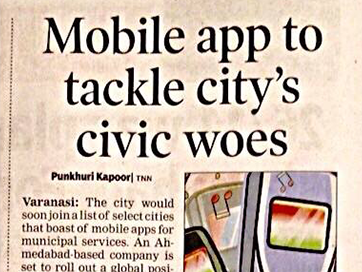 We have successfully launched our SmartCity-311 application in the City of Varanasi that covered by The Times of India on August 5, 2015 edition. It was privileged for us to covered by India’s Leading Business Newspaper. Our Launched application would help Varanasi people to make their city clean by reporting non-emergency issues like garbage in front of their home or anywhere else, potholes and unclean area to officers. The officer would resolve the issues under specified time and send back a photograph indicating the same!